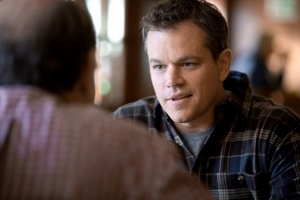 The fracking drama co-written by Matt Damon and John Krasinski (Jim on NBC’s The Office) is a bland piece of storytelling that succeeds very well in hammering the viewer over his head with its biased message. Fracking is the process of hydraulic fracturing, a process in which water and chemicals are injected deep in the ground in an attempt to extract natural gas. That’s an oversimplification that barely communicates any information, entirely appropriate when dealing with Promised Land. Damon, Krasinski, and director Gus Van Sant’s film is all about oversimplifying issues—to the point of condescension. 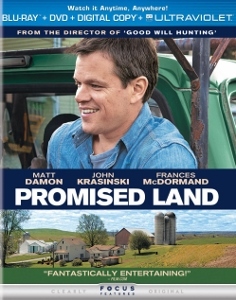 Steve Butler (Damon) and his business partner Sue Thomason (Frances McDormand) travel from small town to small town, convincing farmers to lease their land to Global Crosspower Solutions. Their land is subsequently drilled for gas, with the promise of astronomical paydays for the owners. Butler is a true believer, convinced that his work for Global is essential for these struggling farming communities to thrive again. Thomason sees their mission as nothing more than a job, without a second thought about whether they are hurting or helping the people signing the contracts. Both of these Global agents see the townspeople as easily manipulated, all too willing to accept their pitch. Things are off to a good start for the pair when they first roll into a rural Pennsylvania farm town. 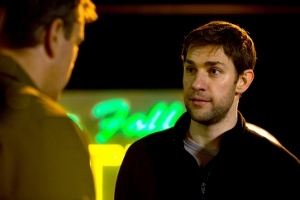 Enter Dustin Noble (Krasinski), an environmental activist working for a small non-profit called Athena. He proves to be a serious thorn in Global’s side as he goes door-to-door, delivers speeches (and karaoke) at the local tavern, and lectures school kids on the evils of fracking. Not helping matters is the town’s elder rabble-rouser, an aged high school science teacher named Frank Yates (Hal Holbrook) who poses questions about the environmental impact of fracking that Butler can’t answer. Yates admires Butler’s conviction, but feels he’s fighting for the wrong team. A divide begins to emerge amongst the people, with some seeing dollar signs but most siding with Noble. From a character standpoint, one of the biggest problems is that we know from the very start that Butler will slowly develop some awareness that Global’s profit-driven interests might not be as honorable as he believed. Probably intended to postpone the inevitable change of heart, Damon and Krasinski throw in a plot twist late in the third act that takes Promised Land damn near into M. Night Shyamalan territory. Without completely giving it away, this twist pretty much ruins Butler as a character. Rather than reacting against the practice of fracking and its potentially dangerous fallout, Butler’s change of heart arises purely from anger towards Global and their duplicitous business practices. Impossibly naïve, Butler’s eyes finally open, not to the possible side effects that could render these people’s farms inoperable, but to the fact that he has been unknowingly used as a pawn. Here’s what Damon and Krasinski should’ve done. Set the story sometime in the not-too-distant future, say a few decades or so. Concoct a fictitious energy-development process that may or may not cause environmental damage, something that could serve as a general parallel for similar contemporary practices. See, in its released form Promised Land plays as a semi-fantasy, populated by characters that have no inner life and are merely meant to stand as opposing positions in an unbalanced debate (that eventually implodes). The paranoia that surges in during the aforementioned third act twist might’ve been more believable if the filmmakers had created a shadowy, conspiratorial future world. The preachiness could’ve been diluted in the process as well by not tackling such a real, on-going controversy. The Blu-ray offers solid, if totally unremarkable, audio/visual presentation. Linus Sandgren’s subdued cinematography looks as good as expected of a modestly-budgeted, modern production. The DTS-HD 5.1 mix is similarly satisfactory without warranting much comment. To my ears, the dialogue was a little too bass-heavy and not quite crisp enough, but this may have been by design in order to add to the near-documentary style Van Sant adopts throughout. A single extended scene and an especially vapid ten-minute EPK featurette are the only supplements. Promised Land was partially funded by Image Nation Abu Dhabi, a company based in the United Arab Emirates. Take that however you want, but it’s impossible to ignore the connection between the UAE, an oil-rich country, and a movie that turns into a shrill screed against mining for natural gas. Regardless of where you fall on the issue of fracking, this is one film that doesn’t shed any useful light one way or the other.